“Life is like a box of chocolates…you never know what you’re going to get.” If you ever watched the movie Forrest Gump, this will ring a bell. (And if not, you just learned a bit of movie trivia.) Picking a chocolate out of an old-fashioned mixed box is an adventure. You might have no idea what you're about to eat. You have to eat it to find out what it is! And the saying applies to life in a thousand ways. Take marriage. We marry somebody we know and love — but we wake up with a stranger. Sometimes we don't even get to pick our own chocolate. Life can seem just plain random. We never really know what the day might hold when we wake up. Bad and even terrible things, good and even wonderful things, just happen out of the blue. Nobody wakes up thinking, “I'm going to die in a car accident today.” And few people wake up thinking, “I'm going to meet the man/woman I will love for the rest of my life today.” Our lives change directions without warning. 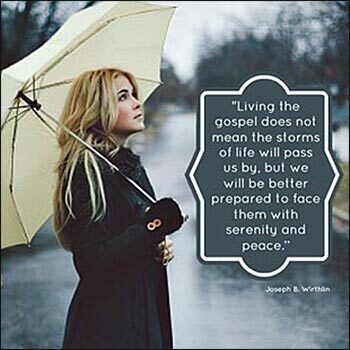 More to the point of the Scriptural quote, even if the weatherman has predicted sunshine, we might suddenly find ourselves caught in a boat in a storm, about to capsize. It happens literally every day, and figuratively, billions of times a day. But when it happened (literally) to the apostles, they had Jesus in the boat with them, and He was . . . asleep! How unworried can a person possibly be? Asleep is pretty much the maximum. There are many lessons from the passage, but when we remember that one of Christ's purposes was to give us a model by which to live, we realize that by being asleep, He is demonstrating to us how much calm we can find in an unexpected storm if we have Him “in our boat”. Whether you are a dedicated Christian, growing in your faith every day, or a complete pagan, you are going to have storms in your life; your body will get old and die. Some of them may be unexpected. But if we have prepared ourselves, we will know that unexpected loss and pain is temporary. Our mental anguish decreases in direct proportion to our faith. We come to know a calm and peace that others cannot; for we are sure of our end. No matter how difficult our circumstance, God will see us through it and we will come to a place of perfect peace. Our boat will never capsize. Lord, give me faith so powerful that it will lift me above all tribulation and pain. men.